The CEO of Xiaomi said “We are truly excited at the limitless possibilities that technology presents to us. Mi Note 2 takes our flagship lineup to the next level, and Mi MIX is a glimpse at what the phone of the future looks like.” The assertiveness of the statement is enormous looking at the new phone Xiaomi has just released. Redmi has already taken us clean sweep and Xiaomi has created other arsons to blow our minds. The best one being Xiaomi Mi Mix “The concept smartphone”. It has a Fresh New design mixed with New technology and beautiful features and is a fresh foray into reinventing new features in the already mastered Xiaomi. 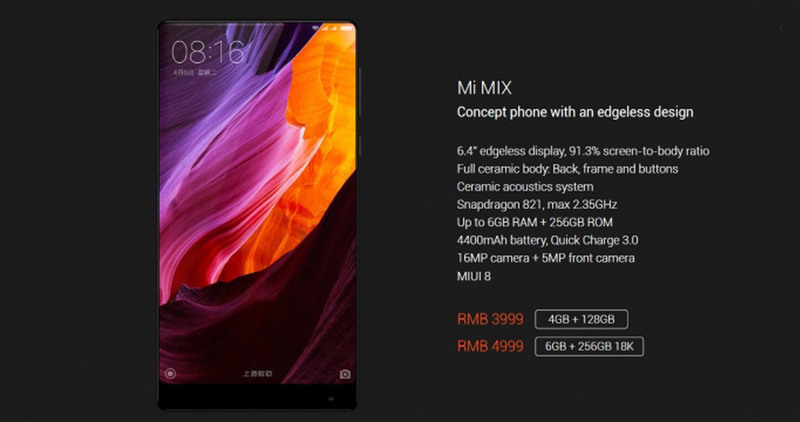 So let’s have a look at the specs of Mi Mix which will go on sale in China starting from 4 November. Xiaomi Mi Mix has a 6.4-inch display with an edge to edge design and a resolution of 2040 x 1080 pixels. The phone looks nearly borderless. The screen-to-body ratio is 91.3 % even beating iPhone 7 by a huge margin. Big shots like Philippe Starck have been involved in the design of the body which is all made of ceramic. Also, piezoelectric ceramic acoustic technology is being used on the phone. The phone boasts a 16MP primary camera and 5MP selfie camera. The images we know will be both lucid and lively. The processor is Qualcomm Snapdragon 821. The RAM of phone differs based on model type. The 128GB model gets 4GB of RAM while the 256GB model gets 6GB of RAM. Regardless to say it’s going to have humongous storage. The battery is 4,400mAh with Qualcomm Quick Charge 3.0 fast charging support. For Connectivity purpose apart from usual features like Wi-Fi, Bluetooth, it has full NFC functionality with a high-precision GPS module. The Mi Mix is priced at RMB 3,499 ($515) for the 4GB RAM model and RMB 3,999 ($590) for the 6GB RAM model. A leather case comes handy with both of them. The phone on one word is phenomenal. From borderless design to efficient processors. This season Xiaomi will win every race it participates in. For everyone looking for a masterpiece to hold and use. This is your one big chance. We just can’t wait to have Xiaomi Mi Mix in our hands.